IL-2 gene transcription occurs in an activation-dependent manner in T cells responding to TCR and CD28 activation. One of the critical events leading to increased IL-2 transcription is an alteration in chromatin structure across the 300-bp promoter region of the gene. We initially showed that IL-2 gene transcription in CD4+ primary T cells is dependent on the NF-κB family member, c-Rel, but not RelA. We found that c-Rel is essential for global changes in chromatin structure across the 300-bp IL-2 promoter in response to CD3/CD28 in primary CD4+ T cells, but not in response to pharmacological signals, paralleling the requirement for c-Rel in IL-2 mRNA and protein accumulation. Interestingly, measurement of activation-induced localized accessibility changes using restriction enzyme digestion revealed that accessibility close to the c-Rel binding site in the CD28RR region of the promoter is specifically dependent on c-Rel. In contrast, restriction enzyme sites located at a distance from the CD28RR behave independently of c-Rel. These results suggest a nonredundant role for c-Rel in generating a correctly remodeled chromatin state across the IL-2 promoter and imply that the strength of the signal determines the requirement for c-Rel. The NF-κB family of transcription factors plays a central role in immune and inflammatory responses, serving to rapidly activate a wide variety of genes involved in host defense against pathogens (1, 2, 3, 4). The NF-κB family is composed of p50 (NF-κB1), p52 (NF-κB2), RelA (p65), RelB, and c-Rel, which share a common region known as the Rel homology domain and function as homo- or heterodimers binding decanucleotide elements in the promoters and enhancers of genes, including those encoding cytokines (3, 4, 5). Deletion of the genes for individual family members in mice has helped elucidate specific physiological roles for each protein; however, the molecular basis of these differences is not well understood (6, 7, 8). The secretion of IL-2 by activated T cells is an important step in an immune response, driving autocrine T cell proliferation and regulating T cell homeostasis (9). The region of the IL-2 gene that responds to T cell activation has been mapped to a 300-bp region immediately upstream of the transcription start site (10, 11) and contains binding sites for numerous transcription factors (12). The IL-2 promoter contains two NF-κB binding sites. One is in the CD28 response region (CD28RR)2 that is referred to as the CD28 response element (CD28RE). This region is required for response to T cell costimulation through the CD28 receptor (13, 14). The CD28RR (−164 to −146 bp) also contains an AP-1 binding region that functions in a cooperative manner with the CD28RE (14). The NF-κB family members that bind to the CD28RE change in a time-dependent manner following T cell activation, with RelA homodimers being a major component at early time points, and c-Rel-containing complexes dominating at later time points, reflecting the need for new c-Rel synthesis (15). Analysis of c-rel−/− mice has demonstrated that c-Rel is essential for the induced expression of several cytokines in T cells (6, 16). A 50-fold decrease is observed in IL-2 protein production compared with that in wild-type (wt) cells when cells are stimulated via TCR/CD28 pathways, but there is no decrease in response to pharmacologic stimuli (6, 16). The genomic DNA in the nucleus is organized into a highly complex structure known as chromatin, which is an important component in the control of gene transcription. One of the first events required for inducible gene transcription is the remodeling of chromatin across promoter and enhancer regions of the gene. Modification of chromatin structure is accomplished by the directed actions of two distinct groups of enzymes, namely ATP-dependent chromatin remodelers and proteins that can covalently modify N-terminal histone tails (reviewed in Refs. 17 and 18). Chromatin remodeling associated with gene activation can be measured by altered accessibility across specific regions using agents such as micrococcal nuclease (MNase) or restriction enzymes (RE) (19, 20, 21). Whereas RE accessibility can provide information on localized changes, MNase measures alterations at a more global level (22, 23). Recently, several laboratories have developed a novel approach to study chromatin accessibility events in vivo that uses real-time PCR (21, 24). This approach has several advantages over the more conventional use of Southern hybridization: the accuracy of quantification is improved; the resolution of the assay is improved by designing primers to amplify small amplicons; and a relatively small quantity of genomic DNA is required, with the assay being in the linear range with 1.5 ng of input DNA (21, 24). These features have previously allowed us to successfully monitor chromatin accessibility events in primary T cells following cellular activation (21). There have been numerous studies showing that DNase I-hypersensitive sites appear across the IL-2 proximal promoter following T cell activation (19, 25, 26). Other studies have shown that a specific RE site located close to the CD28RR becomes accessible for digestion following activation of EL-4 T cells (19). These experiments suggest that the structure of chromatin across the proximal IL-2 promoter is remodeled following T cell activation. We have recently shown that the 300-bp region of the IL-2 proximal promoter becomes selectively remodeled, as measured by MNase and RE accessibility, upon T cell activation not only in EL-4 T cells, but also in primary murine CD4+ T cells (21). This remodeling occurs late (1.5 h) relative to the translocation of many transcription factors to the nucleus, which generally occurs within 10–30 min of activation (21). This delay is not due to the need for prior histone acetylation, nor does it appear to be dependent on the histone kinase Msk1 (21). The roles of specific transcription factors in these events have not, however, been investigated. Here we show that c-Rel is essential for the correct pattern of chromatin remodeling across the IL-2 promoter following primary T cell activation with anti-CD3 and anti-CD28 Abs. This requirement is stimulus specific, however, and can be overcome with the pharmacological agents, PMA and calcium ionophore (I). In contrast to c-Rel, RelA is not essential for IL-2 gene transcription, pointing to a distinct role for these NF-κB proteins in immune cell activation. EL-4.E1.F4 (EL-4) thymoma cells were maintained in RPMI 1640 medium supplemented with 10% FCS, 2 mM l-glutamine, 50 μM 2-ME, and antibiotics. Cells in suspension were stimulated for an optimal period of 4 h at 1.25 × 106 cells/ml with PMA (Roche, Indianapolis, IN), calcium ionophore A23187 (I; Sigma-Aldrich, St. Louis, MO) and an activating CD28 Ab (BD PharMingen, San Diego, CA) at final concentrations of 10 ng/ml, 1 μM, and 5 μg/ml, respectively. All mice were maintained in a pathogen-free environment in a barrier facility. Spleens were isolated from C57BL/6 mice (4–5 wk old), c-rel−/− mice (4–5 wk old), and relA−/− mice (obtained by fetal liver reconstitution of irradiated hosts as described previously (27)), and CD4+ T cells were purified using MACS CD4+ (LT34) beads according to the manufacturer’s guidelines (Miltenyi Biotec, Auburn, CA). The cells were subsequently stained and analyzed by flow cytometry, with T cell populations shown to be ∼90% pure using Abs against CD4+ T cells, CD8+ T cells, B cells, and macrophages. Stimulations were performed as described above for EL-4 T cells. Anti-CD3 stimulation was performed by coating plates with 10 μg/ml anti-CD3 Ab (BD PharMingen) at 37°C for 3 h or overnight at 4°C. The plates were subsequently washed (four or five times) with PBS before the addition of cells at a density of 1.25 × 106/ml. Total RNA was extracted from stimulated and unstimulated T cells (5 × 106 cells) using the modified RNAzol B methodology described previously (28). RNA (1 μg) was subsequently treated with DNase I (1 U/μg RNA) reverse transcribed using 100 U of Superscript II reverse transcriptase (Life Technologies, Gaithersburg, MD) as detailed in the manufacturer’s guidelines. SYBR Green real-time PCR reactions were performed on an ABI PRISM 7700 sequence detector (PerkinElmer/PE Applied Biosytems, Foster City, CA) as described previously (21) with 10 ng of cDNA in a total volume of 25 μl, according to the manufacturer’s guidelines (PerkinElmer/PE Applied Biosytems; protocol 04304965). An aliquot of each sample was also analyzed by quantitative PCR for GAPDH to normalize for inefficiencies in cDNA synthesis and RNA input amounts. The primer sets used are detailed in Table II⇓. To correlate the threshold (Ct) values from the amplification plots to copy number, a standard curve was generated using the appropriate plasmid. Accessibility to digestion with REs and MNase was analyzed using the CHART-PCR assay described previously (21). Briefly, stimulated and unstimulated T cells (5 × 106 cells/sample) were pelleted by centrifugation at 500 × g, washed in ice-cold PBS, resuspended in 1 ml of ice-cold Nonidet P-40 lysis buffer (10 mM Tris (pH 7.4), 10 mM NaCl, 3 mM MgCl2, 0.5% Nonidet P-40, 0.15 mM spermine, and 0.5 mM spermidine), and incubated on ice for 5 min. The suspension was centrifuged at 3000 rpm for 5 min to pellet the nuclei. The nuclei were subsequently washed in the respective digestion buffer (without CaCl2) and then resuspended at 5 × 106 nuclei/100 μl. MNase and RE accessibility assays were performed essentially as previously described (20). One hundred-microliter suspensions of nuclei were then treated with 100 U of HinfI or MseI (Roche) at 37°C for 45 min or with 50 U of MNase (Roche) for 5 min at 20°C. A control without the accessibility agent was used to monitor endonuclease activity. The genomic DNA was subsequently isolated using a QIAamp blood kit (Qiagen, Chatsworth, CA). Fifty micrograms of genomic DNA was used to perform SYBR Green real-time PCR on the ABI PRISM 7700 sequence detector (PerkinElmer/PE Applied Biosystems) in a total volume of 25 μl using the SYBR Green PCR master mix (PerkinElmer/PE Applied Biosystems) according to the manufacturer’s guidelines. The primer sets used are detailed in Table II⇓. To convert the Ct values from the CHART-PCR amplification plots to percent accessibility, a standard curve was generated with genomic DNA. PCR products were visualized on a 4% Nuseive 3/1 agarose gel (PerkinElmer/PE Applied Biosytems) to ensure that a single product was generated in the PCR. All samples were subjected to real-time PCR analysis using Primer Set-F to ensure equal loading of DNA in all PCR reactions. Nuclear extracts were prepared by a modification of the method described by Schreiber et al. (29). Unstimulated and stimulated EL4 T cells (3 × 107/sample) were centrifuged for 5 min at 500 × g, washed with ice-cold PBS, then resuspended in 1 ml of ice-cold buffer A (10 mM Tris (pH 7.4), 10 mM NaCl, 3 mM MgCl2, 0.1 mM EDTA, 0.5% Nonidet P-40, and protease inhibitors) per 1 × 107 cells, and incubated on ice for 5 min. Nuclei were recovered by centrifugation at 900 × g for 5 min, washed in buffer A without Nonidet P-40, then resuspended in 75 μl of buffer C (400 mM NaCl, 7.5 mM MgCl2, 0.2 mM EDTA, 0.1 mM EGTA, 1 mM DTT, and protease inhibitors) per 3 × 107 cells, and incubated in ice with shaking for 15 min. Nuclear debris was removed by centrifugation at 4°C for 15 min. Protein concentrations were determined by the Bradford assay (Bio-Rad, Hercules, CA). Proteins (10 μg) were resolved by SDS-PAGE, transferred to nitrocellulose, and subjected to Western blotting analysis using anti-c-Rel, anti-RelA, and anti-Sp1 (all from Santa Cruz Biotechnology, Santa Cruz, CA) Abs. Proteins were detected using Super Signal chemiluminescent substrate (Pierce, Rockford, IL), visualized using a luminescent analyzer (Las-1000 Plus; Fuji, Tokyo, Japan), and quantified using the Fuji Image Gauge software. The CD28RE within the proximal promoter of the IL-2 gene binds NF-κB family members c-Rel and RelA in extracts from activated T cells (26), and IL-2 protein levels are dramatically reduced in CD3/CD28-activated T cells from c-rel−/− mice (6, 16). To compare the importance of c-Rel and RelA in IL-2 gene transcription, we performed quantitative PCR analysis of IL-2 mRNA levels in CD4+ T cells, treated with CD3/CD28 for 4 h, from wt, c-rel−/−, or relA−/− (obtained by fetal liver reconstitution of irradiated hosts) mice. IL-2 mRNA levels were reduced by 18-fold in c-rel−/− T cells, but were unaffected in relA−/− T cells (Table I⇓). The same results were obtained at several different times of stimulation (data not shown). In contrast to the effect observed with CD3/CD28 stimulation, the absence of c-Rel had no effect on the response of the IL-2 gene to PMA, I, and anti-CD28 (PMA/I/CD28) treatment (Table I⇓). To further support the finding that the requirement for c-Rel is stimulus dependent, we examined the effect of the c-Rel inhibitor, pentoxyfilline, on IL-2 transcription in CD4+ T cells isolated from wt mice stimulated with PMA/I/CD28 or CD3/CD28. Pentoxyfilline has previously been shown to specifically inhibit the translocation of c-Rel, but not the other NF-κB family members or NFAT, to the nucleus (30). Consistent with data from c-rel−/− mice, pentoxyfilline inhibited CD3/CD28-mediated, but not PMA/I/CD28-mediated, IL-2 transcription (Table I⇑). Thus, c-Rel appears to be essential for IL-2 transcription in response to CD3/CD28, but dispensable in the presence of pharmacological activation, while RelA is not essential for IL-2 gene transcription. The initiation of gene transcription consists of several events, including alteration of chromatin structure, assembly of transcription activation complexes, and recruitment of basal transcriptional machinery (18, 31, 32), and c-Rel could be involved in one or several of these events. We wanted to determine whether c-Rel contributed to chromatin remodeling events on the IL-2 promoter or was part of the activation complex that assembled on the remodeled promoter. We first examined the time course of c-Rel mRNA and protein accumulation in EL-4 T cells to ascertain whether c-Rel was present in cells, and more specifically in the nucleus, at the time of chromatin remodeling on the IL-2 promoter. In contrast to RelA or NF-κB1/p50, little c-Rel pre-exists in the resting T cell cytoplasm, and new synthesis is required for significant nuclear accumulation (33). Significant levels of c-Rel mRNA were detected as early as 15 min following PMA/I activation of EL-4 T cells, with maximum levels observed at 2 h (Fig. 1⇓a). Thereafter, levels dropped slightly, but were then maintained at relatively high levels up to 16 h postactivation (Fig. 1⇓a). c-Rel protein began accumulating in the nucleus at 30 min following stimulation; higher levels were observed from 1 h poststimulation and were sustained until at least 4.5 h following activation (Fig. 1⇓b). These results show that c-Rel accumulates in the nucleus before the time that IL-2 promoter chromatin remodeling is initiated (1.5 h; Fig. 1⇓a) (21) in EL4 T cells, which, in turn, precedes the accumulation of IL-2 mRNA (Fig. 1⇓a). Similar kinetics of c-Rel accumulation, IL-2 mRNA production, and promoter remodeling were observed in primary CD4+ T cells (data not shown). The accumulation of nuclear c-Rel correlates with changes in IL-2 chromatin accessibility. a, Comparison of IL-2 chromatin remodeling kinetics, as measured by MNase digestion, with c-Rel and IL-2 mRNA kinetics measured by SYBR Green real-time PCR. IL-2 and c-Rel mRNA levels are plotted as fold change relative to the unstimulated samples. Remodeling is plotted as a percentage of the unstimulated, MNase-digested genomic DNA sample. Data shown are the mean and SE of three replicate experiments. b, Nuclear extracts were prepared from EL-4 T cells, either unstimulated (NS) or stimulated with PMA/I for 0.5–4.5 h. Ten micrograms of nuclear extract from each time point was resolved on SDS-PAGE and subjected to Western blotting analysis using anti-c-Rel (upper panel) and anti-Sp1 (lower panel) Abs. c-Rel accumulates in the nucleus much later than RelA or many other transcription factors thought to be involved in IL-2 gene transcription (15, 33) and appears to closely precede promoter chromatin remodeling. The time frame of c-Rel accumulation and chromatin remodeling suggests that new protein synthesis may be required for these events. c-Rel, but not RelA, accumulation in the nuclei of EL-4 T cells was indeed dependent upon new protein synthesis (Fig. 2⇓a), in agreement with previous data (34). A small amount of c-Rel was detected in cycloheximide (CHX)-treated nuclear extracts at all time points examined and may represent a small pool of pre-existing c-Rel in the EL-4 cells (Fig. 2⇓a). 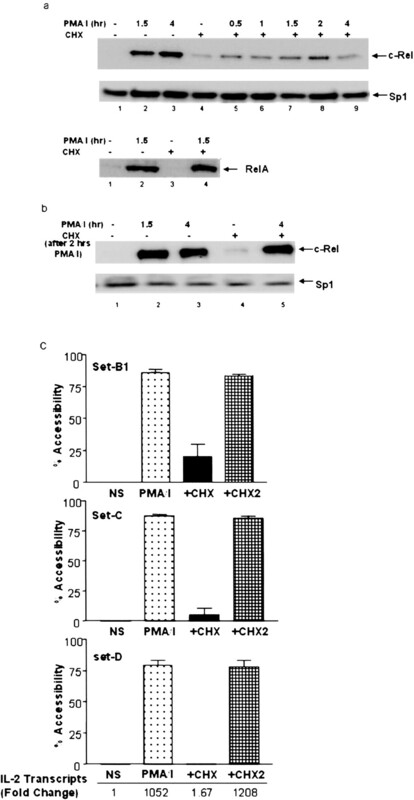 In contrast to the inhibition of c-Rel by pretreatment with CHX, nuclear translocation and maintenance of c-Rel were not affected by addition of CHX 2 h after stimulation with PMA/I (Fig. 2⇓b). Constitutively expressed Sp1 was used to monitor equal protein loading in all lanes. Chromatin remodeling across the IL-2 gene promoter is dependent on protein synthesis. a, Nuclear extracts were prepared from EL-4 T cells stimulated with PMA/I for the indicated times with or without pretreatment with CHX for 30 min. Ten micrograms of nuclear extract from each time point was resolved on SDS-PAGE and subjected to Western blotting analysis using anti-c-Rel (upper panel), anti-Sp1 (middle panel), and anti-RelA (lower panel) Abs. b, Nuclear extracts were prepared from EL-4 T cells unstimulated (lane 1), stimulated with PMA/I alone for 1.5 h (lane 2) or 4 h (lane 3), and unstimulated or stimulated with PMA/I for 2 h before the addition of CHX for an additional 2 h (lanes 4 and 5). Ten micrograms of nuclear extract from each time point were resolved on SDS-PAGE and subjected to Western blotting analysis using anti-c-Rel (upper panel) and anti-Sp1 (lower panel) Abs. The immunoreactive bands were visualized using a Fuji-Film FLA-1000 phosphorimager. c, Nuclei for MNase digestion or RNA for IL-2 expression analysis were prepared from EL-4 T cells pretreated with CHX for 30 min and left unstimulated (NS), stimulated with PMA/I for 4 h, pretreated with CHX for 30 min before stimulation with PMA/I (+CHX), and stimulated with PMA/I for 2 h before the addition of CHX (+CHX2). The intact nuclei were incubated with or without 50 U of MNase for 5 min at room temperature. Genomic DNA (50 ng) for each treatment was subjected to real-time PCR analysis using primer sets B–D. The Ct values generated were converted to DNA concentration and percent accessibility using a standard curve. The mean and SE of three replicate experiments are shown. IL-2 mRNA levels were measured by SYBR Green real-time PCR analysis. The fold change in IL-2 mRNA levels for each of the treatments is shown relative to the control value. Significant amounts of c-Rel, therefore, accumulate in the nucleus following 1 h of activation, and this accumulation is driven by de novo synthesis. c-Rel appears to be relatively stable in the nucleus even in the presence of protein synthesis inhibition. We next asked whether chromatin remodeling across the IL-2 promoter was dependent on new protein synthesis. To investigate changes in chromatin structure associated with IL-2 gene transcription, MNase accessibility across the promoter was measured using a quantitative CHART-PCR (21), where the amount of PCR product is inversely proportional to the extent of MNase digestion occurring across the amplified region (21). The requirement for de novo protein synthesis for chromatin remodeling of the IL-2 promoter was determined by CHART-PCR using three primer sets spanning the 300-bp IL-2 promoter (Table II⇓ and Fig. 4⇓a). As we have previously shown (21), the IL-2 promoter is completely inaccessible to MNase digestion in resting EL-4 T cells, and stimulation with PMA/I resulted in 80–85% accessibility across the 300-bp promoter region (Fig. 2⇑c). Pre-treatment of EL-4 T cells with CHX 30 min before PMA/I activation inhibited accessibility across the entire IL-2 promoter (Fig. 2⇑c) and was paralleled by an inhibition of IL-2 mRNA accumulation as measured by quantitative PCR (Fig. 2⇑c). To determine whether protein synthesis was required for maintenance of the remodeled state, EL-4 T cells were treated with CHX following 2-h stimulation with PMA/I (at a time when chromatin remodeling has already occurred), and remodeling was assayed 2 h later. The IL-2 proximal promoter was still accessible to MNase under these conditions (Fig. 2⇑c), and in parallel, IL-2 transcript levels were not inhibited (Fig. 2⇑c). These results show that new protein synthesis is required for the efficient initiation, but not maintenance, of chromatin remodeling across the IL-2 promoter, implicating newly synthesized proteins, such as c-Rel, in this process. To explore the possibility that c-Rel is required for chromatin remodeling across the IL-2 promoter, chromatin accessibility was examined in CD4+ T cells isolated from wt and c-rel−/− mice. As we have previously shown (21), activation of primary CD4+ T cells with CD3/CD28 leads to an increase in MNase accessibility across the IL-2 promoter (Fig. 3⇓a). In contrast, there was little or no increase in MNase accessibility in CD3/CD28-activated CD4+ T cells from c-rel−/− mice, with levels of accessibility being identical with those of unstimulated cells (Fig. 3⇓a). This lack of chromatin accessibility is in agreement with the decrease in IL-2 mRNA levels seen in c-rel−/− T cells (Table I⇑). However, when c-rel−/− T cells were treated with PMA/I/CD28, almost normal levels of MNase accessibility were observed in parallel with normal levels of IL-2 mRNA accumulation (Fig. 3⇓a and Table I⇑). Chromatin accessibility across the IL-2 promoter is inhibited in rel−/− primary T cells activated with CD3/CD28. a, Nuclei for MNase analysis were prepared from either wt (W) or c-rel−/− (R) CD4+ T cells that were left unstimulated or stimulated with PMA/I/CD28 or CD3/CD28 for 4 h. The intact nuclei were incubated with or without 50 U of MNase for 5 min at room temperature. Genomic DNA (50 ng) for each treatment was subjected to real-time PCR analysis using primer sets B–D. The Ct values generated were converted to DNA concentration using a standard curve, and MNase accessibility was expressed as a percentage of the unstimulated, digested genomic DNA sample. b, CD4+ T cells were either untreated or pretreated with pentoxyfilline for 30 min and then left unstimulated or stimulated with CD3/CD28 for 4 h. Intact nuclei were isolated and incubated with 50 U of MNase for 5 min at room temperature, and the amount of MNase accessibility was measured and calculated as described in a. Since the c-Rel inhibitor, pentoxyfilline, blocks CD3/CD28, but not PMA/I/CD28, activation of IL-2 in primary T cells (Table I⇑), we asked whether pentoxyfilline also inhibited chromatin remodeling across the IL-2 promoter in response to CD3/CD28 stimulation. Pentoxyfilline pretreatment partially inhibited MNase accessibility across the promoter in CD3/CD28-activated cells (Fig. 3⇑b), with the largest effect seen across the region encompassing the binding site for c-Rel at the CD28RE (Fig. 3⇑b). These results show that c-Rel is required for correct chromatin remodeling across the IL-2 promoter in response to CD3/CD28 activation, but this requirement can be overcome by pharmacological agents. In addition, our results illustrate that MNase accessibility closely parallels IL-2 mRNA accumulation. To gain insight into localized changes in chromatin structure across the IL-2 promoter, we examined RE accessibility, which can be influenced by localized chromatin structure, DNA conformation, and/or transcription factor binding (22, 23). Three MseI sites and two HinfI sites, chosen to measure accessibility at a range of sites across the promoter (Fig. 4⇓a), were examined using CHART-PCR (21). The majority of the RE sites became accessible to RE digestion in wt CD4+ T cells treated with CD3/CD28 or PMA/I/CD28 (Fig. 4⇓b). The one exception to this general accessibility was the HinfI site at −100, which became accessible in response to PMA/I/CD28, but not in response to CD3/CD28 (Fig. 4⇓b). These results indicate that while there is a general change in promoter architecture, as measured by MNase accessibility, individual promoter regions have distinct modes of accessibility. RE accessibility across the IL-2 promoter in primary T cells. a, Schematic representation of the murine IL-2 proximal promoter from −300 bp to the transcriptional start site. The locations of the primer sets B–D used in the CHART-PCR assay are indicated in a, and the details of the primer sets are shown in Table II⇑. The positions of the MseI (MseI-B, MseI-C, MseI-D) and HinfI (HinfI-A, HinfI-B) RE sites are also shown. Functional control elements are also indicated (▩). The approximate position of the nucleosome across the CD28RE is indicated above the promoter. b, Nuclei for RE accessibility analysis were prepared from CD4+ T cells unstimulated or stimulated with PMA/I/CD28 and CD3/CD28. Nuclei were incubated with 100 U of MseI or HinfI at 37°C for 45 min. Genomic DNA (50 ng) from each sample was subjected to real-time PCR analysis using the appropriate primer set detailed in a. The Ct values were converted to DNA concentration using a standard curve, and accessibility was expressed as a percentage of the unstimulated, uncut DNA sample. The results represent the mean ± SE of three experiments from separate groups of mice. To examine in more detail the requirement for c-Rel in remodeling the region around its binding site at the CD28RE, the accessibility of RE sites across this region were examined in c-rel−/− T cells. The accessibility observed at the HinfI-B site (−150) in wt cells in response to CD3/CD28 was inhibited in c-rel−/− cells (Fig. 5⇓a). In contrast, the HinfI-A site (−100) that was not accessible in CD3/CD28-activated wt cells became accessible in the activated c-rel−/− cells (Fig. 5⇓a). 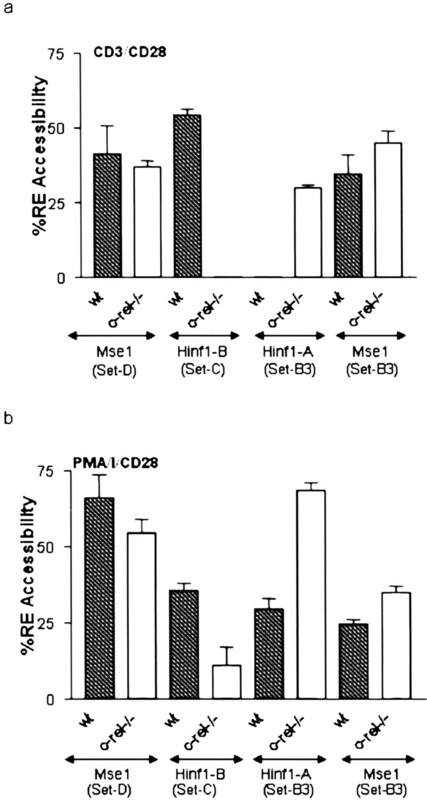 The same pattern of RE accessibility was observed in PMA/I/CD28-activated c-rel−/− cells, with a decrease in accessibility at sites located across the CD28RE (HinfI-B, Fig. 5⇓b; DraI, data not shown) and an increase at the −100 HinfI site (Fig. 5⇓b). The CD28RE region is less accessible to RE digestion in CD4+ T cells from c-rel−/− mice. Nuclei for RE analysis were prepared from wt or c-rel−/− murine CD4+ T cells unstimulated or stimulated with CD3/CD28 (a) and PMA/I/CD28 (b). Nuclei were incubated with 100 U of MseI or HinfI at 37°C for 45 min. Genomic DNA (50 ng) from each sample was subjected to real-time PCR analysis using the appropriate primer (Fig. 4⇑a). The Ct values were converted to DNA concentration using a standard curve, and accessibility was expressed as a percentage of the unstimulated, uncut DNA sample. The results represent the mean ± SE of three experiments from separate groups of mice. To examine accessibility at RE sites located further from the c-Rel binding site, MseI sites at −40 and −250 were compared in wt and rel−/− T cells. In contrast to the decrease in accessibility observed at RE sites close to the CD28RE, activation-induced accessibility at these MseI sites was not decreased in CD3/CD28-activated c-rel−/− cells (Fig. 5⇑a). Similarly, access to these RE sites was not affected by the absence of c-Rel following PMA/I/CD28 activation (Fig. 5⇑b). These data indicate that while c-Rel is required for correct RE accessibility at sites close to the c-Rel binding site at the CD28RE, sites located at a distance behave in a distinct manner. We have shown here that c-Rel, but not RelA, is essential for correct chromatin disruption and IL-2 gene transcription in CD4+ primary T cells. The observation that RelA was not essential for IL-2 gene transcription was surprising given previous results showing that RelA accumulates in T cell nuclei following activation, binds to numerous NF-κB sites including the CD28REs of genes such as IL-2, and can trans-activate these promoter regions in transient transfection assays (12). These data clearly show that the NF-κB/Rel proteins play nonredundant roles in gene transcription in T cells. We have presented several lines of evidence to shown here that c-Rel is required for a correctly altered chromatin state across the IL-2 proximal promoter in CD3/CD28-activated primary T cells. Firstly, MNase accessibility across the entire promoter is prevented in the absence of c-Rel. Secondly, RE accessibility close to the c-Rel binding site at the CD28RR is also dependent on the presence of c-Rel. Clearly, other NF-κB proteins are not sufficient to generate an accessible chromatin configuration across the promoter, since the expression and activity of the other NF-κB proteins are normal in c-rel−/− T cells (6, 16). 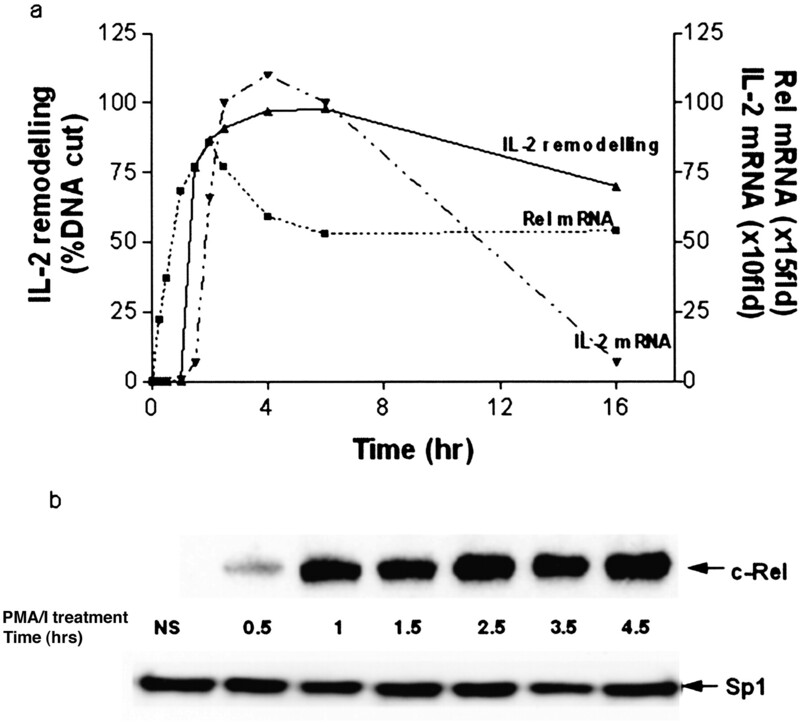 In addition, we have shown here that RelA is dispensable for IL-2 transcription. Thirdly, the kinetics of c-Rel accumulation in the nucleus as well as its response to cycloheximide treatment closely correlate with chromatin remodeling kinetics on the IL-2 promoter. Thus, c-Rel may play a specific role in recruiting chromatin-modifying complexes to the promoter or may play a role in stabilizing a remodeled state. It has recently been shown that c-Rel is not required for chromatin remodeling across the IL-12 p40 promoter in LPS-activated macrophages (35), although it is required for efficient gene transcription (35). It is not clear why these results differ from those presented here for IL-2, although c-Rel may have a cell- or gene-specific role in chromatin remodeling. Since we have shown that access to RE sites only in the region of the c-Rel binding site requires c-Rel, it should be noted that RE accessibility at a site distant from the c-Rel binding site in the IL-12 p40 promoter was used to show that c-Rel was not required (35). It is intriguing that c-Rel is required for chromatin disruption and gene transcription in response to CD3/CD28, but not in response to PMA/I/CD28. Interestingly, our results are consistent with two separate studies showing that a mutation within the CD28RE resulted in the loss of responsiveness of the IL-2 promoter to Ag receptor stimulation (36), but had no effect on PMA/I inducibility (13). 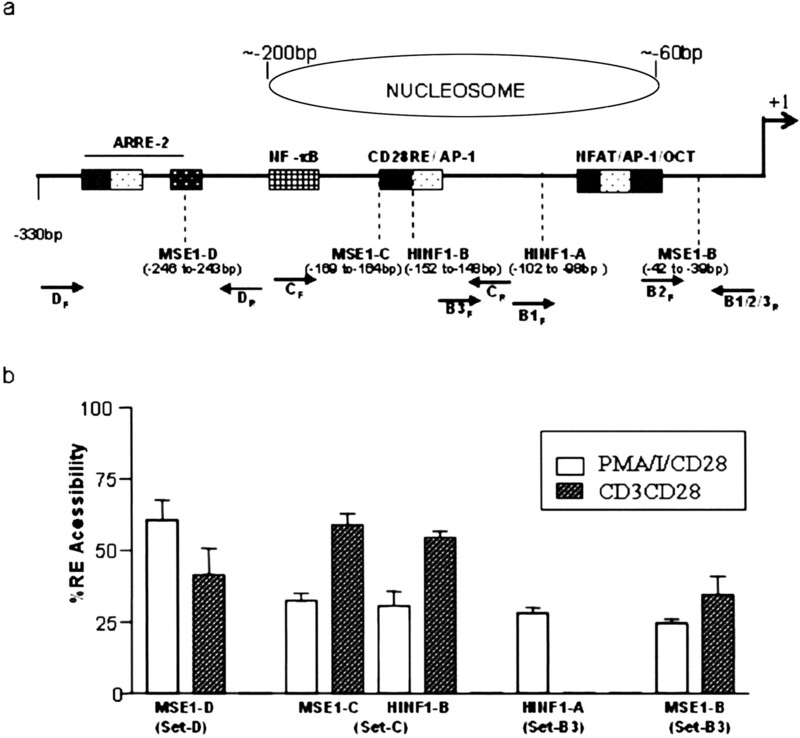 PMA/I/CD28 is clearly a stronger stimulus, leading to 100-fold more IL-2 mRNA that CD3/CD28. A strong signal such as PMA/I may generate threshold levels of other transcription factors, such as NFAT (36) and NF-MATp35 (37), which have previously been shown to interact with the IL-2 promoter, including the CD28RE, perhaps reducing the need for c-Rel. These results support a threshold model for chromatin remodeling as well as for gene transcription where the density of a specific set of factors, and not an individual factor per se, is the key to driving promoter function. The fact that CHX inhibits chromatin remodeling in response to P/I in EL-4 cells implies that in addition to c-Rel, CHX is inhibiting other factors involved in chromatin remodeling. The identity of such factors and whether they cooperate with c-Rel to allow chromatin remodeling across the IL-2 promoter will be important to determine. It is unclear why pentoxyfilline treatment is less potent at inhibiting chromatin accessibility across the entire promoter than deletion of c-Rel from the genome, although significant inhibition was seen across the CD28RR region following pentoxyfilline treatment. Pentoxyfilline has previously been shown to inhibit c-Rel translocation into the nucleus (30), and we have shown here that it completely inhibits IL-2 mRNA accumulation in response to CD3/CD28 activation. It is possible that c-Rel has direct as well as indirect effects on chromatin remodeling and that the latter are only seen when T cells develop in the absence of c-Rel. It is clear that the effects seen in either c-rel−/− cells or pentoxyfilline-treated cells are sufficient to inhibit gene transcription in response to CD3/CD28. In addition, pentoxyfilline may inhibit other aspects of IL-2 gene transcription to give complete abrogation of mRNA production. RE accessibility has been equated with MNase or DNase I accessibility as a means of measuring chromatin remodeling (19, 20, 35), but it is now becoming clear that these agents may be measuring different events. The data presented here imply that RE accessibility is measuring a specific local event that is affected by binding of transcription factors as well as chromatin remodeling events. This is particularly evident for the two HinfI sites at −100 and −150, which are most likely located within the same positioned nucleosome (38), but behave independently. We have previously shown that the human IL-2 promoter can assemble a highly positioned nucleosome in vitro and that a similarly positioned nucleosome is present in vivo (38). We have recently shown that the mouse promoter assembles a nucleosome in a similar position in EL-4 T cells spanning these two HinfI sites (S. Rao et al., unpublished observations). The independent behavior of RE site accessibility is consistent with several recently published findings showing that RE accessibility measures disruption of local chromatin structure as a consequence of transcription factor binding (22) and/or changes in the conformation of nucleosomes (39) without the loss or movement of any underlying nucleosomes. Importantly, access to RE sites close to the c-Rel binding site at the CD28RE is dependent on the presence of c-Rel, while sites that are more distant are independent of c-Rel. The binding of other transcription factors, such as NFAT or AP-1, accessing their binding sites in the presence of chromatin, could be creating RE accessibility to these more distant sites. In contrast, MNase may be measuring dramatic unfolding of a higher order structure or complete disruption of nucleosomes across the promoter, events that are dependent on c-Rel. It is important to note that MNase accessibility correlates with IL-2 mRNA accumulation, whereas RE accessibility at specific sites is not indicative of the level of gene transcription. However, we need to be aware that current approaches to measure changes in chromatin structure, using nucleases and REs, do not provide detailed information on the nature of the chromatin alterations upon cell activation. It is important to realize that accessibility changes can be attributed to many mechanisms, including nucleosome sliding, displacement/replacement of activators and/or repressors, and conformational changes/alterations in the fluidity of nucleosome structure as a consequence of histone modifications such as acetylation or methylation. Thus, it will be important to determine more precisely the nature of the events measured by the different accessibility agents to gain a better understanding of the molecular processes involved in chromatin remodeling. It is interesting that the HinfI site at −100 is inaccessible in CD3/CD28-activated T cells, while all other sites tested become accessible. This site is close to a negative regulatory region, the negative regulatory element-A (NRE) site that binds a zinc finger, E box-binding repressor, ZEB (40, 41), which is a potent repressor of IL-2 transcription. Yasui et al. (41) have shown that PMA/I stimulation reduces NRE-1 binding activity in IL-2-producing T cells by 40%. Thus, the accessibility observed at this site upon PMA/I/CD28 stimulation in CD4+ T cells could be a consequence of reduced NRE-1 binding in stimulated cells. The lack of accessibility at this site in CD3/CD28-activated cells suggests that a weaker stimulus may not provide an appropriate signal to remove a negative regulatory complex from this site. This may account in part for the 100-fold lower level of IL-2 mRNA seen in CD3/CD28 compared with PMA/I/CD28-activated T cells. Activation of c-rel−/− T cells resulted in increased accessibility at the NRE-A binding site (HinfI-A) compared with that seen in wt T cells. This suggests that the absence of c-Rel relieves repression at the NRE-1 site on the IL-2 promoter, perhaps through a direct effect on the synthesis or activity of components of the repressor complex or, alternatively, through an effect on chromatin structure from the loss of c-Rel binding at the CD28RE. It is clear from the work presented here that for CD3/CD28 activation, c-Rel is required to generate an accessible chromatin configuration across the entire promoter, as measured by MNase accessibility, or at the CD28RR, as measured by RE accessibility. Since the strength of the stimulus appears to determine the need for c-Rel, these findings have implications in understanding how T cells respond to different Ag doses or Ags of different affinities. In addition, c-Rel and RelA do not have overlapping roles in IL-2 gene transcription, and it will be interesting to determine whether they control distinct sets of genes during T cell activation. We are grateful to Adele Holloway and other members of the Shannon laboratory for helpful discussions, and to David Tremethick for discussions and comments on the manuscript. 2 Abbreviations used in this paper: CD28RR, CD28 response region; CD28RE, CD28 response element; CHART-PCR, chromatin accessibility by real-time PCR; CHX, cycloheximide; Ct, threshold; I, Ca2+ ionophore A23187; MNase, micrococcal nuclease; RE, restriction enzymes; wt, wild type; NRE, negative regulatory element.